Sounds ridiculous, right? Well, nearly as ridiculous as that is the idea that a man can “become” a woman, complete with a DNA and chromosome change. 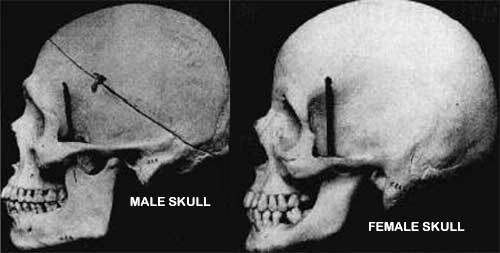 What about a man’s bigger, heavier skull and jawbone (as opposed to a woman’s) – is Jenner gonna keep those or is he gonna try to have them replaced somehow? That is why women talk so damn much—they don’t need much energy to move their jaws, since their jaws are much lighter than those of men. Jenner is just another transvestite who had enough money for surgery. He will soon find out that it is not enough. Not nearly enough. The most obvious normal physical difference between male and female: the former is wide at the chest and narrow at the hips; the ladder is narrow at the chest and wide at the hips. Jenner is selling news. The popular transsexual and media are raking in the fiat dollars. Next stop New York and LA dinners for the new monstrosity. Serial TV shows used to be an effective way to promulgate leftist doctrines. Up until about 1990, normal middle-class people would actually follow certain shows quite regularly , and then comment on them the next day at work/school. Conversation regarding the shows would pressure co-workers & co-students to similarly follow the shows to be able to participate in the work/school chit-chat. The lead characters were universally upheld as likable; therefore, the resulting conversations would uphold the character’s “heroic” leftist stand, or at least fail to criticize her stand. For example, in attacking the right of Whites to form social organizations, Samantha on the popular “Bewitched” denounced the “snobbery” of all country clubs. Mary Richards on the “Mary Tyler Moore Show” followed suit; refusing to join a social club which did not admit Jews. People tended to avoid insulting these popular TV characters publicly. Only in private, did people refer to “Webitched” or speak of how Endora was right about Darren, and sneer at how “perfect” Mary Richards was. Thereby the left achieved its goal: to intimidate citizens from openly criticizing the ideas presented by the supposedly brave, attractive heroines. The combo of leftist TV drama presentation followed by work or school group members seeming to affirm the correctness of the popular character’s position, or at least not challenging their position, was a highly effective method of social coercion. Several years (if not decades) have passed since I have heard a co-worker mention a TV show. “Seinfeld” and “Law and Order” were the last such shows, and both series were met with vitriol which would have been unthinkable in the 60s or 70s. “I hate Jerry” was a common refrain. Partly this phenomenon was due to multiculturalism: having destroyed the common culture, pressure to agree with common sentiments (liking certain celebrities, for example) had also been destroyed. The leftist establishment was now faced with a dilemma: How could they implement the same highly effective coercion method, now that no one will bother to sit through a regular TV show? Their solution was ingenious: Politically-based stories are now created that are “semi-real.” For example, we can assume that a man named Bruce Jenner actually exists, and that certain events of his life can be documented. But the rest of the sordid tale is all fantasy-fiction, designed to change the public’s political views on homosexuality. The purpose of pushing homosexuality is to destroy the White family; the last surviving social organization in support of the White race. The general public knows and talks about semi-real Jenner at work, school and other social environments, and also about his semi-real family; since the “news” flow over the internet is fairly inescapable. But the truth remains that Jenner is a real person in the sense that Samantha Stevens was really a suburban witch. Bruce Jenner is a cyber-sit-com. Re Mary O, original and excellent observations! Referring to Jenner as a woman is an insult to real females, like Ann Coulter and Hillary Rodham Clinton.